Darrah Brustein: You write, “Digital minimalism is much more than a set of rules. It’s about cultivating a life worth living in our current age of alluring devices.” What is digital minimalism, and are these concepts of living a good life and living with our devices mutually exclusive? 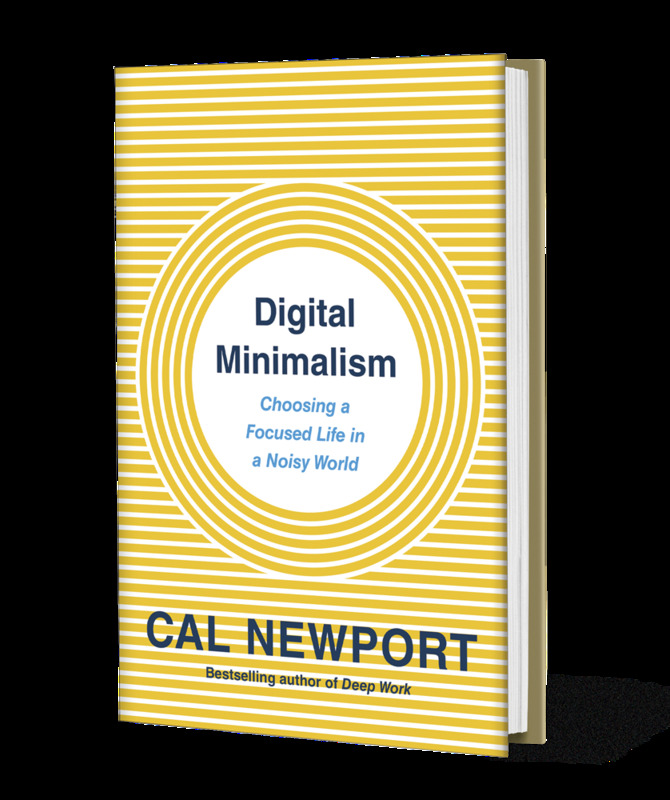 Cal Newport: Digital minimalism is a philosophy of technology use, where you start with what’s most valuable to you, and then you work backward and say, ‘What’s the best way to use technology to support these things?’ So, it’s about embracing technology, but doing so on your terms, instead of the terms of the technology companies themselves. Newport: The digital declutter is my suggested process if you want to transform your life rapidly into a digital minimalist life. It’s a ‘rip the bandaid off’ style approach, and the idea is you start by taking 30 days off from any optional technology in your personal life. Anything you can get away with not using without its causing major negative ramifications. During this period, you try to get back in touch with your values, what’s important to you. Also, you also begin to rediscover the type of analog activities with which we used to fill our time before we got these persistent low-quality digital distractions. Then, when the declutter is over, you rebuild your digital life from scratch, adding back in only things for which you have a very strong argument for how they’re going to support something that’s really important to you. So, it’s like taking all of the junk out of your house, and then when you’re finished, only bringing back in things that are really important. Newport: Last January, I asked for volunteers. I thought maybe 50 or 60 people would sign up because it’s a big ask, but over 1,600 people actually signed up to go through this. One of the most important things I learned from talking with them is that they had forgotten, or hadn’t realized, the degree to which the low-quality digital had pushed out of their lives the type of high-quality activities on which they used to spend a lot of time. They had never decided to stop doing these things, it had just been slowly pushed out more and more by their screen and their tablets. They were surprised to the same degree to remember how much they really enjoyed the type of things they used to do before there was a screen that is capable of providing this constant stream of low-quality distraction. Quality analog activity is really, really important and really, really meaningful. Consequently, a lot of people who go through this decluttering process find that they end up doing a lot more of that, and a lot less of staring at the little glass rectangle. Brustein: It’s like digital weight gain in that it’s cumulative and small. Over time, you look in the mirror and you realize you gained 50 pounds. Cal Newport: Yeah, exactly. I also often equate digital minimalism to stronger philosophies about health and fitness: that just telling people to eat better doesn’t make them more healthy. 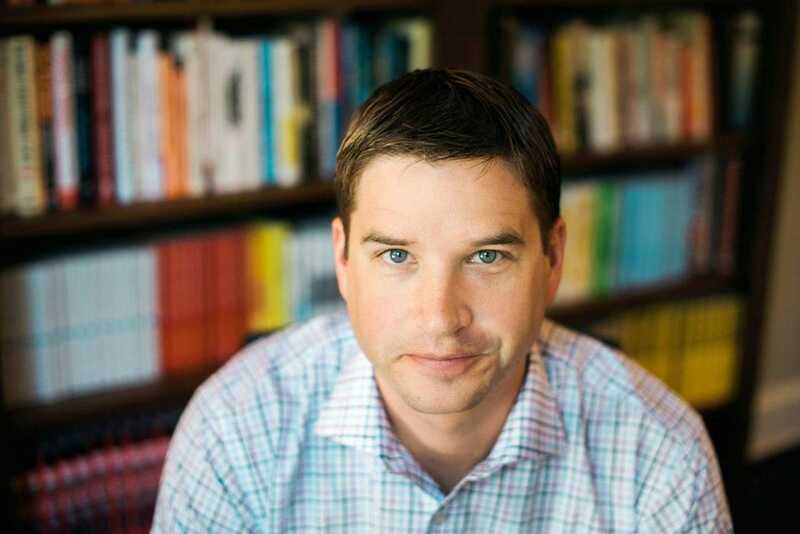 The healthiest people we know usually have a philosophy: they’re vegan or they’re paleo or there’s a philosophy they believe in, and it’s the same thing for digital life. The tips don’t get us there. You need a philosophy that you believe in and that you can buy into. Brustein: It’s like creating an identity that you want. Brustein: You report that it’s common to hear people say, “I wish I could quit but I just can’t”. What’s the real hurdle? Newport: When people think about their digital life just through the lens of the particular tech they use and whether or not it’s useful, they don’t get very far. This is because, for every particular thing in their life, they can then spin a pretty compelling story about why it’s necessary. Part of why digital minimalism works where these type of ad hoc audits don’t is that you’re starting from a positive place, which is ‘I want my life to be as good as possible’. How can I use tech to make that happen? Building up something really good from scratch is much easier for us to do than trying to look at what’s in place, and piece by piece, trying to improve it. Brustein: You argue that there’s an overall net-negative effect on the clutter of too much technology and talk about the importance of intentionality in what, when, and how you use it. Can you share more about this? Newport: The idea of minimalism more generally is much broader than just technology. It goes back to antiquity and we see it come up again and again. Two of the big ideas for why minimalism works, for why doing less can give you more, are those two things you just mentioned. The first is that when you clutter your life with things, even if each of these things brings you a little bit of value, the net-negative impact of having so much stuff pulling at your time and attention can outweigh the sum of all of the value. An example of this is someone, like a hoarder, who has way too much stuff in his house. He can rationalize the need for any individual item you point to: why he needs that old newspaper; why that birdhouse might be useful one day. However, the net-negative impact of a house overflowing with junk is much worse than the positive benefits he’s getting from what he owns. It’s just the same in your digital life. The other reason why this ‘less is more’ mantra works is that there’s a huge positive benefit in just being intentional. As soon as you step back and say, ‘I am making big decisions for the purpose of making my life better’, you get a huge positive boost from just that decision, which can often way outweigh the loss of minor value or minor inconvenience that is caused by those decisions. The intentionality itself is much more important than the fact that now it’s a little bit harder for you to know when someone’s birthday is because you’re no longer on Facebook. Newport: Cost-benefit thinking is important. In our culture, we tend to focus just on benefits, which gives you what we call the ‘maximalist mindset’. It’s easy to only look at the benefits of various things, and then you get very worried about missing out on those benefits. So, if you’re only looking at what’s the benefit of X, Y, and Z, you’re going to be very worried not having X, Y, and Z in your life. The minimalist mindset looks at the costs just as much as the benefits. Look at the issues caused by surfing Twitter: 1. This takes your time away from other things that might be more valuable. 2. You must keep in mind that the Twitter experience might be optimized to pique your emotions, let’s say, or make your anxious or upset or outraged. (There’s actually potentially a direct-negative cost as well). One of the big ideas behind digital minimalism is to think not only about the potential benefits of things, but about the cost of those things as well, and figure out if it should be in your life at all. Newport: If you want to get started, I recommend that you delete from your phone any application where someone makes money if you click on it. That alone is going to change your relationship tools. You’re going to be a lot less exploited and have a lot more breathing room, and that could be the foundation on which you build a much more meaningful digital life. Newport: I’ve noticed in the last couple of years that people’s attitudes towards their digital life has been shifting. Whereas it used to be that people would tell self-deprecating jokes about using their phone too much, now people are becoming actually authentically distressed. People are starting to become worried, and the main way that they articulate this concern is autonomy, that they are using these things more than is useful. Increasingly, they feel manipulated, in terms of how they feel and what they believe. I think if we let that go unchecked, it’s going to have a major impact on the psychological health of our culture, as well as on the ability of people in our culture to live thriving lives. I really think the way the attention economy, in particular, is going right now is a major threat to what we see all the way back to the Declaration of Independence. Our country is built on this notion of the pursuit of happiness. I think it’s actually going to be a major threat to that fundamental goal. Newport: The attention sector of the economy has been around since at least the mid-nineteenth century. This refers to making money from the time and attention of let’s say, newspaper readers, radio audience, or television audience. This has always been around, but it’s never been nearly as big or powerful as it is today. Facebook, for example, has a higher market cap than ExxonMobil, meaning that they’re actually making significantly more money extracting time and attention from your head than ExxonMobil was making by extracting oil and natural gas from the ground. That’s unprecedented. Newport: This is one of the paradoxes around social media: It was designed to help us connect with people more easily, and yet, we have a growing number of these well-done studies that are finding the more people use social media, the more likely they are to be lonely. One of the leading explanations for why this might be true is that when people do more digital interaction, they do less real-world interaction. The digital interaction is easier than the real-world interaction, and they feel as if they’re being sufficiently social. What we’re finding is that digital interaction is not nearly as fulfilling as a real-world interaction. As you push out the old-fashioned analog real-world conversation with likes and emojis and text message windows and tags on Instagram photos, you’re not getting nearly the same rewards that you would have had if you were with friends in person having coffee, or on the phone, having a real conversation with a relative. Brustein: You share “tough love” that we should let go of our weak ties. However, there is a Stanford study about the strength of weak ties that suggests that there is great value in them. What is your response to that? Newport: This whole phenomenon of weak-tie connections being crucial was actually really puzzling if you step back and look at it in historical perspective. One of the supposed advantages you get by being on a digital social network like Facebook is that it allows you to keep some connection with weak-tie acquaintances, people that you would otherwise not have any contact with. Around the same time, we’ve had the growth of network scientists, where people have tried to study that there are benefits for weak ties. This typically comes from graph-theory style network analysis that shows how information spreads and what’s the right way to connect a graph, and what are different measures of connectivity. That’s all interesting theory, but it doesn’t change the reality that we are not evolved for weak-tie friendships. There’s no evidence that a thriving social life actually requires that you know the date of the birthday of someone you haven’t seen since high school. When I push people to move their interactions back to the real world, one of their concerns is that is going to leave a lot of people off the table. I don’t have time to do real-world interaction with all the people with whom I’m Facebook friends, and my response is, fine. I think you are going to be happy socially going back to the way that we’ve socialized for hundreds, if not thousands, of years, which is, you have close friends, family members, and community people, whose life you know a lot about, that you’re invested in, and with whom you interact in the real world. That’s the formula for a thriving social life regardless of what a network scientist says about some mathematical analysis of how information moves through networks with a particular graph conductance or what-have-you. Brustein: I believe that one way to nurture relationships is to use in-between moments like commute times to send a text or make a call. You suggest creating phone office hours: what is that and what’s the value? Cal Newport: I’ve never had a social media account. For the most part, I don’t use the Internet for entertainment, though I do use it as a source of news of major league baseball trade rumors, which I think is one of the most crucial purposes of the Internet. I have a smartphone, but I’m often without it, and I’m often trying to find it because I haven’t seen it in a long time. When I use the Internet, it’s usually for a specific purpose. As a computer scientist, I think technology is very exciting but I use it in a very careful way. Brustein: From your studies, it seems that some people had to rediscover how to fill their newly-found-free time. What’s your best suggestion for those who need to uncover hobbies or things they really enjoy doing, where once they spent it on their devices? Newport: I discovered that quality analog leisure activities are definitely like a magic pill. People have lost these from their life and when they put them back into their life, it’s a huge source of satisfaction and it can go a long way towards diminishing their taste for low quality digital distraction. How do you find these things? Let your instincts guide you. My recommendation is to look for analog activities that require some skill at which you can improve. It’s much more fulfilling if it’s a skilled activity at which you improve over time. Also, all things being equal, analog activities that have a social component can be doubly rewarding. Newport: I’m convinced that the way that we’re going to solve the problems, or the sense of unease that people feel increasingly in regards to their digital life, is by changing the culture. We’re going to change the way the people think about these tools, and the place that they have in their lives. Whether or not everyone becomes a digital minimalist or not is not so important to me, but that people start to actually think about their technological lives with a lot more care and say this is my philosophy for how I use these tools. Brustein: Is there anything else you’d like to add? Newport: One thing that surprised me as being really important when I looked into this topic is that there’s huge value in spending time alone with just your own thoughts. One of the things we don’t always realize about ubiquitous internet connectivity is that for the first time in human history, it can actually allow us to remove all solitude from our life. There is huge negative consequences when this happens. On a regular basis, we absolutely need time alone with our thoughts, just to unwind, or to think, or to try to understand what’s going on in our lives. So this is a point I’ve been pushing pretty hard. You need to be away from phones and computers and tablets regularly. You have to just force yourself to be alone with your thoughts. It’s daunting at first, but it’s foundational to a healthy and thriving life. Newport: I think someone’s written about that already, I’m not quite sure. Not sure I can go cold turkey on my socials, but I am inspired to keep better balance. New weekend goals: spend time alone in nature, hang out with friends in a physical bar, and maybe even, gulp, read a physical book. Thanks for the great article Darrah.